Police have renewed an appeal to trace a Tillicoultry cyclist who disappeared during a 104-mile (167km) bike ride three months ago. Tony Parsons, 63, was last seen at about 23:30 on 29 September at the Bridge of Orchy Hotel. He then headed south along the A82 towards Tyndrum. It is believed Mr Parsons was attempting to cycle home to Clackmannanshire after leaving Fort William that afternoon. Police officers have worked with Coastguard teams and mountain rescue teams from Killin, Oban and Arrochar to search for Mr Parsons in the Tyndrum and Bridge of Orchy area. 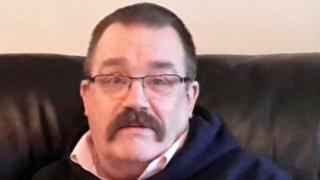 Chf Insp Drew Sinclair said: "Sadly, Tony remains missing and his family have had to go through Christmas without him and without answers as to where he is. "Any information, no matter how small it may seem, could be key to helping us find Tony." Mr Parsons left an address in Ross Court, Tillicoultry, at about 09:30 on 29 September and caught a train to Fort William, leaving the town on his bike at about 16:10. Police know that he passed through Glencoe village at about 18:00. Mr Parsons is 5ft 9in tall, of stocky build, with short hair and a moustache. He wears glasses and was last seen wearing a distinctive red waterproof jacket. He was earlier seen wearing a blue, long-sleeved cycling top, a high-viz vest, fingerless gloves, beige combat trousers, a silver and grey cycling helmet and walking boots. He was carrying a silver and blue backpack and had a yellow-framed bike with black handlebars. Chf Insp Sinclair said: "I would continue to appeal for anyone who saw a man matching Tony's description or who may have seen, found or taken possession of a yellow bike along the route of the A82 on 29 September or in the days after to contact us as soon as possible."